The BYD High Voltage B-Box H 5.1 kW Solar Battery Storage comes in sections to allow you to build your battery to your required power. This expandable system allows a lower cost of entry into self consumption/energy storage from your solar system allowing you to build over time. The system is compatible with SMA Energy Storage Inverters. This version BYD High Voltage B-Box H 5.1 Battery Storage would come with 5 x 1.28 kW Lithium Battery Stacks and the BMU which forms the base and top section of the package. 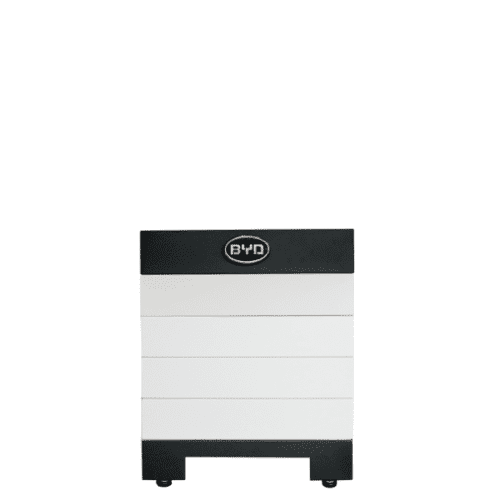 BYD High Voltage B-Box H 5.1 kW Solar Battery Storage has the highest output power in industry, which brings the highest performance to customers. The system is able to reach C rate at max 1C and 2C at peak to support critical loads such as A/C and pumps, etc.